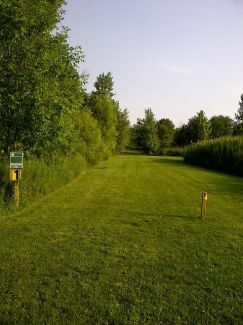 Description: A small but challenging 9-hole course in the township park. Looks easier than it seems but you’ll need accuracy to escape without a scratch. NOTE: After hole 6, walk north (behind DPW building) to the woods where hole 7 begins. Local Directions: From the south: Take Jefferson Rd/Green St (along Anchor Bay) to Meldrum Rd @ blinking yellow Emergency Signal. Turn North. Take Meldrum Rd 1/2 mile until you get to the township offices and fire station on the right (east). Use the parking lot near the township municipal offices. From the North: Take 26 Mile (aka Marine City Hwy) to County Line Rd. Turn south on County Line Rd and travel 3 miles to Jefferson Rd/Green St. Turn Left (east) and follow above directions from the south..
Disc Golf Course located south of the playgrounds and water plant. Hole #1 starts behind Township office parking lot.